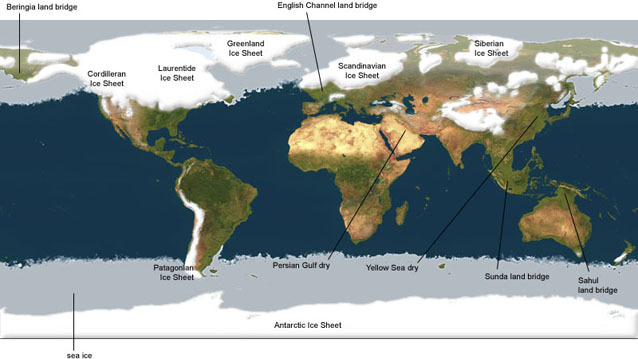 A modern view of the world based on satellite imagery is modified using a historical climate model which shows areas of land and sea ice, and an ocean depth model which shows areas of the sea floor exposed as land during the last ice age. The sequence was produced for an exhibition at the Kunsthalle, Bonn. Source data: Satellite Imagemap, ETOPO2 digitial terrain and bathymetry, ice cap extent estimates, ice age sea surface temperature estimates.